How about that Total Lunar Eclipse this past July 13th? It has been a busy year for astronomy for sure, with two total lunar eclipses, a comet fading out from an unexpected burst of glory, and Saturn, Jupiter and Mars reaching opposition in quick succession. Now, watch for a rare event this weekend, with the final eclipse for 2018 coming up on Saturday, August 11th, with a partial solar eclipse spanning northern Europe and the Arctic. What’s so unique about this eclipse? Well, not only is it the last one for 2018, but it’s part of three eclipses in the second eclipse season of the year. Most seasons only feature two eclipses (one lunar and one solar) but every few years or so, it is possible to have a season with three: either lunar-solar-lunar (such as occurred in 2013) or solar-lunar-solar. This is only possible when the middle eclipse occurs very near ascending or descending node along the ecliptic. The nodes are where the path of the Moon, inclined 5.1 degrees relative to the ecliptic plane intersect it—when these nodes are occupied by an alignment of the Earth, Sun and Moon (known as a syzygy, a fine word in Scrabble to land on a triple word score, though you’ll need a blank tile for the third ‘y’) a solar or lunar eclipse occurs. For an eclipse triple play, the middle eclipse needs to happen very near a node crossing, producing a fairly long eclipse. That’s exactly what happened on July 28th, when the Moon crossed through descending node just over an hour after crossing out of the Earth’s umbral shadow after the longest lunar eclipse for the 21st century. This also leaves the Moon close enough to the opposite ascending node two weeks post and prior to July 28th on July 13th and August 11th to just nick the Sun for a partial solar eclipse, one over the Antarctic and one over the Arctic. Saturday’s partial eclipse touches down over the eastern coast of Canada at sunrise. From there, it sweeps eastward over Greenland, Iceland and the North Atlantic, with the Moon’s penumbra just grazing the northern United Kingdom before crossing over Scandinavia. Then, the shadow crosses over Asia, with a photogenic partial solar eclipse wrapping up at sunset over eastern China, the Koreas and the Russian far east. Note that this eclipse is also a relative newcomer for its particular saros 155, as it is member 6 of a series of 71 eclipses. The saros just began less than a century ago on June 17th, 1928, and won’t produce its first total solar eclipse until September 12th, 2072 AD. As of this writing, we’ve yet to see evidence of anyone carrying the eclipse live, though we’ll note it here if any webcast(s) surface. When is the next one? Well, the next partial solar eclipse is on January 6th 2019, and the next total solar eclipse occurs on July 2nd, 2019. This weekend’s eclipse at New Moon also sets us up for a fine display of the Perseid meteors for 2018. This year, the Perseids are expected to peak on the morning of August 12th and August 13th. Watch for a zenithal hourly rate of 100 meteors per hour at the peak. A dependable annual favorite, the Perseids are debris remnants of period comet 109/P Swift-Tuttle. The live webcast for the 2018 Perseid meteor shower. Credit: The Virtual Telescope Project. Astronomer Gianluca Masi and the Virtual Telescope Project 2.0 will host a live webcast for the 2018 Perseids on August 12th starting at 20:30 UT. Don’t miss the astronomical action worldwide this weekend, either live or online. Author’s note: This Superbowl Sunday event and 101 more like it are featured in our latest free e-book, 101 Astronomical Events for 2017, out now from Universe Today. Sure, this Superbowl Sunday brings with it the promise of sacks, fumbles and tackles… but have you ever seen the Moon run down a star in the end zone? Just such an event, referred to as an occultation, happens this weekend for folks living around the Mediterranean and — just maybe for some sharp-eyed, telescope-owning observers based around the Caribbean region — this coming weekend. We’re talking about Sunday’s occultation of the bright star Aldebaran by the 64% illuminated waxing gibbous Moon. This is the 2nd occultation of Aldebaran by the Moon for 2017 and the 28th of the current ongoing cycle of 49 spanning from January 29th, 2015 to September 3rd, 2018. The Moon actually occults Aldebaran and Regulus once for every lunation in 2017. We won’t have another year featuring the occultations of two +1st magnitude stars (Spica and Antares) again until 2024. The footprint for the February 5th occultation of Aldebaran by the Moon. The broken lines show where the occultation occurs during daytime, and the solid lines denote where the occultation occurs under dark skies. Image credit: occult 4.2. 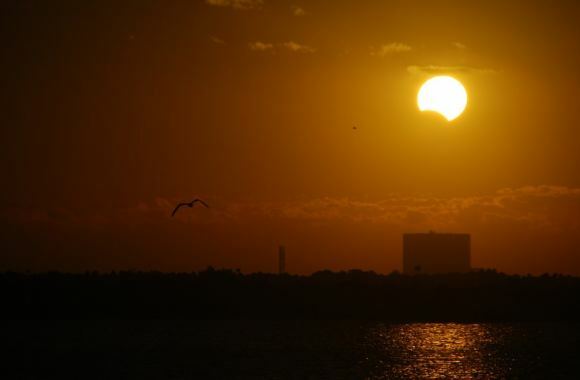 The event occurs under dark skies for observers based around the Mediterranean and under daytime afternoon skies for folks in central America, the Caribbean, northern South America and the Florida peninsula, including Astroguyz HQ based in Spring Hill, just north of the Tampa Bay area. We’ve managed to spy Aldebaran near the daytime Moon while the Sun was still above the horizon using binocs, and can attest that the +1st magnitude star is indeed visible, if you know exactly where to look for it. Note that, like solar eclipses belonging to the same saros cycle, occultations of Aldebaran in the ongoing cycle drift north and westward from one to the next, to the tune of about 120 degrees longitude. Though most of North America sits this one out, we do get a front row seat for next lunation’s occultation of Aldebaran on the evening of March 4/5th. The next one is the best bright star occultation of Aldebaran by the Moon for North America in 2017. And be sure to check out the Moon this Sunday evening after the big game, and note Aldebaran hanging just off of its bright limb. The ref will have a close call to make for this one. The northern grazeline in Florida might make this an especially interesting event to watch, though it’ll be challenge, as the occultation occurs in the afternoon under daylight skies. This crosses right along near the cities of Jacksonville and Gainsville. Clear, deep blue high contrast skies are key, and we’ll be watching from Astroguyz HQ north of Tampa Bay during this event. The northern grazeline across the Florida peninsula for Sunday’s ‘big game’. Credit: Dave Dickinson. The view from Jimena de la Frontera Spain just before the occultation. Credit: Stellarium. Note that this occultation spans five continents, a truly worldwide event. The International Occultation Timing Association (IOTA) maintains a page with an extensive list of times for cities worldwide. Note that when the Moon tackles Aldebaran, its also crossing the scrimmage line of the Hyades open cluster, so expect numerous occultations of fainter stars worldwide as well. Aldebaran is the brightest star along the Moon’s path in our current epoch, along with runner-ups Spica, Regulus and Antares. Though Aldebaran is 1.5 times the mass of our Sun, it’s also 65 light years away, and only appears 20 milliarcseconds (mas) in size, about the equivalent of a 40 meter diameter crater from the distance of the Moon. Still, you might just notice a brief pause as Aldebaran fades then winks out on the dark limb of the Moon, a tiny hitch betraying its diminutive angular size. And the clockwork gears of that biggest game of all, the Universe, grind on. Don’t miss this first big ticket astronomical event for February 2017, coming to a sky above you. Next up, we’ll watching out for another bright star occultation, two eclipses, and the close passage of a comet near the Earth. If — like me — you’ve been focusing on all the great images and news coming from the Mars Science Laboratory, perhaps you’ve missed the great view of the “Martian Triangle,” now visible in the night sky at twilight! Astrophotographer John Chumack hasn’t missed the view. This image is from August 6, 2012 from his observatory in Yellow Springs, Ohio. The Martian Triangle show starts at twilight, and you can find it by looking low in the southwestern sky. The star at the top is actually the planet Saturn, the star on the bottom left is Spica, and the bright spot on bottom right is the planet Mars. And remember, somewhere in your field of view, there’s a few spacecraft on and around Mars and another orbiting Saturn. John took this image with a modified Canon Rebel Xsi DSLR and a 47mm Lens, at F5.6, ISO 800, 10 second exposure. See more of John’s wonderful astrophotos at his Flickr page or at his website, Galactic Images. If you’ve fallen for the enchantment of a night out watching the stars, you’ll relate to and revere in this new timelapse video.